Johannesburg (South Africa) – As the clock counts down towards 1 March an unprecedented amount of last minute changes have been made to the EFC AFRICA 18 fight card, with four athletes grasping the opportunity by stepping-up to fight on just a few days notice. 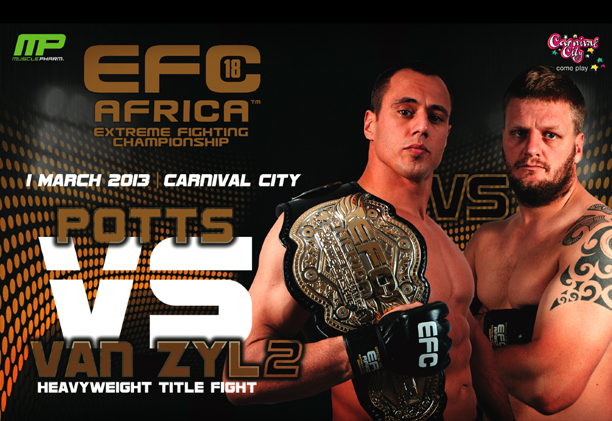 EFC AFRICA 18, presented by MusclePharm, takes place at the Carnival City Big Top Arena on 1 March 2013. Tickets on sale at Computicket www.computicket.com and tickets for the live broadcast to Nu Metro Cinemas available at www.numetro.com.